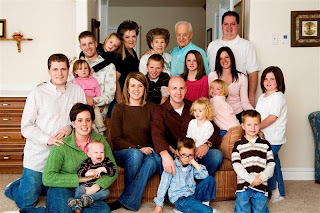 Since I highlighted my family last week, it is Matt's family's turn. Three reasons why I have enjoyed being a part of Matt's family the last 5 years. 1. They are very supportive of one another. I have always been impressed with how they stick up for one another and support each other through good and bad. 2. They know how to work hard, but also how to play hard. They take some great annual trips together and the pictures make it look like it is great fun. Matt and I have only been able to attend a few trips because we live so far away, but hopefully we'll get out on the boat again soon. I might not be up for another camping trip though :) Just kidding, I had a great time despite my wet shoes from 4 wheeling. 3. Todd (Matt's brother) is one of the best cooks ever!! No formal training, he just has a knack for it. (I will also say that Des' cottage cheese jello salad is pretty amazing). I also LOVE my nieces and nephews on Matt's side. Hopefully they will remember that they have an Uncle Matt and Aunt Megan! I made some picture cards of our families so we can teach Blake who all his relatives are even though he doesn't get to see them very often. Plus did I mention, they can raise the roof? I figure if my sister can do Vegan March in April, then I can get away with doing my Thursday Three on Friday. 1. They are REALLY funny (her whole blog is funny, but here is the latest). 2. I love their kids. 3. My mom cooks the best Sunday dinners. Anyone else miss their family? I finally finished my quilt squares for my Michigan Quilt. Eight friends and I got together and are each making a quilt square having something to do with living in Ann Arbor. Each person makes 9 and then we will exchange them so our quilt will have nine different quilt blocks. I did the Michigan M. Check it out. Here is Blake with his new favorite toy, the Ikea bag. These pictures were taken last weekend, but he had it out again today. He puts it over his head and runs around. Today he ran right into the table leg and fell over. I couldn't help but laugh because it looked like something from a cartoon. I thought today you could all get to know me better. Here are three weird things about me. I would like to be able to say they are quirky things, but in all honesty they are just weird! 1. I won't turn the radio volume to number 13 because it is unlucky. 3. I have to check the front door multiple times to make sure it is locked. Sometimes I just have to stand there and look at it until I have convinced myself it is locked. This is just the tip of the iceberg, but lucky for me I won't have to reveal them since it is Thursday Three not Thursday Thirty. Anyone else care to share something about them? You all know you have something!! Here is Blake's latest accomplishment. The last three songs I downloaded on i-tunes. Any recommendations for my next three? I looked over one day and here is Blake sitting in the frying pan. This is after a morning outside playing in the dirt. Can you believe how curly his hair is?